Katie Stubblefield was only 18 when she was severely injured by a self-inflicted gunshot wound. Her life was saved in hospital, but the young woman had life-changing injuries and had lost most of her face. Now 22, the youngest US recipient of a face transplant has shared the results of several years of exhaustive reconstructive surgery with National Geographic magazine. The publication was given unprecedented access by an Ohio clinic which operated on Katie when she was just 21. A journalist and photographers followed her preparation and the results from the invasive 31-hour procedure. 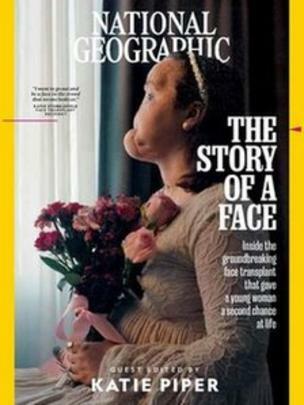 The Story of a Face is on the cover of the magazine’s September issue, and Katie’s story is also told in a documentary online. There have only been 40 recipients of a face transplant throughout the world. The first full-face procedure was successfully carried out by Spanish doctors in 2010. But because surgery is still considered experimental, it is not covered by US insurance providers. Katie’s surgery was eventually funded by the Armed Forces Institute of Regenerative Medicine, which wants to improve treatment of military personnel who are injured at war. Katie, now 22, was deemed a good candidate because of her age and the nature of the injuries she had sustained. The transplanted face came from 31-year-old Adrea Schneider, who died from a drug overdose in 2017. What’s it like living with a face transplant? She was already an organ donor, but the decision to donate her face came from her grandmother, Sandra Bennington, who has since met Katie following the surgery. Katie says she cannot remember much about the period before her suicide attempt, but family say she had been struggling emotionally with moving around, a failed relationship and chronic gastrointestinal health problems throughout her teens. The bullet wound destroyed much of her face – including her nose, some of her forehead and jawbone. She also had brain injuries and significant damage to her eyes. After being initially treated in Mississippi, she was transferred to Tennessee before ending up at the Cleveland Clinic in Ohio – a facility already performing pioneering transplant procedures. Before the transplant, Katie had already undergone 22 reconstructive surgeries, including using her thigh and 3D printing to help reconstruct her jaw. She and her family say they did not even know what the procedure entailed when they were notified she could be eligible.